Ecotourism is a much-contested term ecologically, economically and politically. It has been used by proponents of ecotourism comprising practitioners from government departments and industry, to open up new areas for tourism. It has, unfortunately, opened avenues for tourism industry to promote initiatives that have had a profound impact on people and environment in the name of ecotourism. Indigenous and local communities have raised concerns and even resisted the onslaught of such development of ecotourism at international, regional, national and state levels. On the other hand, there are also instances of communities cautiously using ecotourism as a means to augment their sources of livelihood and income. Ecotourism or tourism in a sustainable manner can potentially enhance the livelihood of local people, particularly those living in and around ecologically fragile areas and, as a result, also provide local people an incentive to conserve these areas. However, there is little or no consensus over the definition of ecotourism. Each ‘player’ has tried to define it to his or her advantage. Communities have accused ecotourism – its definition and concept of being largely industrydriven, developed through non-consultative processes. The voices of concern raised during the International Year of Ecotourism in 2002 and the processes that led to it, including the World Ecotourism Summit, are a testimony to this. Globally, much has been written on, about, for and against ecotourism. An enormous amount of information exists in print and in digital form on the World Wide Web. 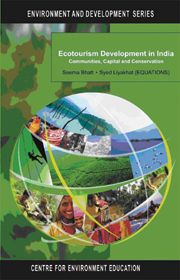 The case studies showcased in this book illustrate that the term ecotourism is applied across a range of activities on different scales. In Korzok, Ladakh, local communities themselves have felt the need to be involved in tourism related activities and desired to have a stake in this enterprise by operating homestays. At the other end of the country, in Coorg, there are homestays being promoted by coffee plantation owners who also provide a local flavour but are very different from those in rural settings. Homestays, in general are initiated and managed by the local community and the benefits go directly to them. There is a strong link to nature in these initiatives since they are by and large, set in wild or natural surroundings. Homestays cater to a range of tourists starting from the low budget tourists to IT professionals from Bangalore who want to spend a weekend on a Coorg coffee plantation. There are other initiatives like those in Dzongu and Pastanga regions of Sikkim where local communities and NGOs have together developed ecotourism activities ranging from trekking to nature walks. Local communities in the Nanda Devi Biosphere have, through appropriate interventions over a period of time, come to play an important role in regulating and managing tourism in the area. On another end of the scale is ‘high end ecotourism’, where ‘eco-friendly’ resorts are being promoted by entrepreneurs, who may or may not be local. For ecotourism development to be sustainable, it is important that it follows the directives provided in various international covenants and national policies and laws. This chapter, introduces a few crucial legal and policy frameworks at the international level, which have a bearing on the manner in which ecotourism is developed in India. There are numerous codes, guidelines, protocols and charters on ecotourism and sustainable tourism that have been formulated by different stakeholders especially governments, tourism industry and inter-governmental and non-governmental organisations. It would be beyond the scope of this book to enumerate and analyse all these covenants. Some important covenants have been analysed and presented. These are Agenda 21, 1992; Commission on Sustainable Development; Convention on Biological Diversity; International Year of Ecotourism, 2002; General Agreement on Trade in Service; the UN's Declaration on Rights of Indigenous Peoples and the UNWTO Global Code of Ethics for Tourism, 2000. Agenda 21 is an outcome of the Earth Summit at the Rio de Janeiro United Nations Conference on Environment and Development (UNCED) in 1992. It is a well-defined programme of action for global sustainable development. It addresses the global environment and development problems and suggests strategies, plans, policies and processes to achieve a balance between environment and development. It addresses social and economic dimensions, conservation and management of resources for development, strengthening the role of major groups and means of implementation. It is evident that tourism is growing rapidly worldwide, providing economic, environmental and social benefits. Tourism benefits financially through its multiplier effect, creates employment and brings about regional development. It also cultivates tolerance and encourages knowledge of different cultures, while aiding in the preservation of heritage and the environment. However, recent trends within tourism development in the country have raised several concerns about the adverse impacts of tourism. Government policies seldom acknowledge the negative fallouts of tourism development and continue to render an open invitation to tourists and investment in tourism. Tourism depends heavily on natural and human resources and its inroads into protected areas and untouched zones have often been at high costs. A market-driven model of tourism development that has privileged industry and tourists' needs over local people's interests often leads to privatisation of common property resources for exclusive use by industry and displacement of local communities to make room for tourism establishments. Low levels of participation in the formal, more lucrative tourism industry and reduced access to resources have resulted in paltry benefits to local communities. Uncontrolled and unregulated tourism growth, often based on shortterm priorities, invariably results in unacceptable impacts that harm society and the environment. In essence, tourism development today has raised serious questions as to who its real beneficiaries are. This has led to the emergence of a more sensitive form of tourism, which aims at minimising these costs and maximising benefits. Ecotourism is a term debated upon by practitioners all over the world. The initiatives carried out in the name of ecotourism have adversely affected people and the environment. The indigenous and local communities have raised voices against such steps at local, national and international levels. However, sustainable ecotourism  tourism carried out within certain defined norms, can lead to the development of the people. Ecotourism Development in India attempts to present a comprehensive and analytical perspective on the development of ecotourism in India. This book showcases the key policies and legal frameworks linked to ecotourism development at national and international levels. The consequences of large-scale models of ecotourism in terms of responses and impacts, both negative and positive, are presented through select case studies. It is intended to facilitate effective formulation and implementation of conservation and development policies and practices. Seema Bhatt is an independent consultant working on issues related to biodiversity. Her particular focus of work is on strengthening the links between conservation of biodiversity and livelihoods of local communities. She views ecotourism as one such link and has coordinated two projects on ecotourism as the South Asia Coordinator for the USAID supported Biodiversity Conservation Network. Syed Liyakhat has a background in environmental sciences and specialises in sustainable tourism research and advocacy. He is the Coordinator of the Ecosystems, Communities & Tourism Program in EQUATIONS, an organisation founded in 1985 to understand the impacts of tourism development, particularly in the context of liberalised regimes, economic reforms and the opening up of the economy. At the national level, there exists a legal and policy framework that supports or has the potential to support ecotourism. At the state level, there are several states that have developed their own ecotourism policies or tourism policies with specific reference to ecotourism. This chapter presents an analysis of some of the key national legal and policy instruments in context to ecotourism. It then goes on to analyse some selected state tourism/ecotourism policies. There are great variations in the state policies. Analysis of these policies reveals that each state seems to interpret ecotourism in its own way. This brings to the fore, the need for a common understanding of the concept and its implementation. The sections included in this chapter are Legal Framework, Policy Framework and State Tourism/Ecotourism Policies. In 1972, the Parliament enacted the Wildlife (Protection) Act pursuant to the enabling resolutions of 11 states under Article 252(1) of the Constitution. The Wildlife (Protection) Act provides for State Wildlife Advisory Boards, regulations for hunting wild animals and birds, establishment of sanctuaries and national parks, regulations for trade in wild animals, animal products and trophies, and judicially imposed penalties for violating the Act. Harming the endangered species listed in Schedule I of the Act is prohibited throughout India. Hunting other species, like those requiring special protection (Schedule II), big game (Schedule III), and small game (Schedule IV) is regulated through licensing. Tourism is the world's fastest growing industry and in recent years, has come to play an increasingly dominant role in the economies of developing countries. This is especially true for 49 of the less developed countries of the world. Many governments are in the run to garner a percentage of this voluminous 846 million strong tourist traffic (UNWTO, 2007). There have been successful ecotourism initiatives in the country and more are beginning to be established. These initiatives are from various parts of the country, ranging from the Trans Himalayan region of Ladakh to the tropical forests of Kerala. This chapter attempts to showcase some of them. The chapter provides an insight into how these initiatives were established along with a brief analysis of what has emerged from some of them. Initiatives in ecotourism, range from community driven ones such as the one in Ladakh, to those supported by the Forest Department as in the case from Periyar in Kerala. What is interesting to note is that each followed a rather unique methodology of planning their respective initiatives. The Dzongu endeavour used the Appreciative Participatory Planning and Action (APPA) methodology. The ecotourism planning at Korzok Lake in Ladakh used local people to impart training that they themselves had gone through. The Klionoma Village in Nagaland carried out an environmental impact assessment to first ascertain the impacts from tourism and then plan a sustainable tourism initiative. It is significant that each ecotourism effort has been supported by an NGO or in some cases even the State Government. Despite geographical and other differences, many points of commonality arise from these case studies. Primary among these is the importance of a local community institution to carry out ecotourism activities, facilitate benefit sharing and to resolve any potential conflicts. This chapter looks at the voices of dissent the world over to protest against what is happening in the name of ecotourism. It covers aspects particularly relating to the International Year of Ecotourism (IYE), 2002 and presents two case studies from the national level, of protests against what was being promoted as ecotourism before and after the IYE. By the year 2002, when the decision to celebrate the IYE was made, it had become clear that ecotourism had many pitfalls, particularly if misinterpreted. There were serious reservations that celebrating the IYE was premature and it would only imply a greater push for thoughtless ecotourism causing more negative impacts. It was felt that advancing the IYE at this stage would mean enhancement of social, environmental and other problems for communities who are completely unprepared to take on increased tourism. There were suggestions to review the IYE and use it instead as a platform to understand risks, and offer an opportunity to address the challenges posed by tourism, development and environment. However, the IYE programmes went ahead as planned with six regional conferences the world over. The culmination of the IYE was the World Ecotourism Summit, which was also fraught with problems and several protests were registered, aimed at both the content and process of the event. Closer to home, major tourism projects in the garb of ‘ecotourism’ were being launched in ecologically sensitive areas at the cost of local livelihoods. The chapter focuses on perception, production, communication and application of knowledge by the farmers while managing an indigenous irrigation system. The data generated were form a fieldwork conducted in Chattis Mauja indigenous irrigation system (CMIS) located in the plains of Rupandehi district in western Nepal. The population in the command area is characterised by cultural and caste/ethnic diversity and despite this, the irrigation system has been effectively functioning for a long time and is often cited as an example of the participatory and sustainable irrigation system in Nepal. Ethnographic methods like key informant interviews, field observation and household census were the principal data-gathering tools. In addition, focus group discussion was also used. Nepalese farmers have recognised the importance of water resources for centuries and have been constructing irrigation systems at their own initiatives to augment agricultural yields. This tradition has given birth to Farmer Managed Irrigation Systems (FMISs). Historically, irrigation development has fallen under the domain of a religious trust, individual initiatives and/or community effort. The legal tradition and local administrative structures over a period of time have permitted FMISs to operate without interference from an irrigation agency or administrative unit. However, they have been assisted by the government from time to time when natural calamities required resources beyond the capacity of the farmers (Paradhan 1989; Pradhan and Bandaragoda 1998). A substantial portion of the country's irrigated area is under numerous FMISs scattered across the country. This book analyses how diverse knowledge systems operate in the field of natural resource management in Nepal. In order to examine the status of knowledge systems interface and identify the challenges of participatory and deliberative governance of natural resources, the book presents six case studies on forest, agriculture and water governance at different levels – from local community (such as a farmer managed irrigation system) to national research system (such as national agricultural research council) and civil society networking (such as national federation of community forestry users). The over arching issue being addressed in the book is – how questions of equity, efficiency and sustainability in natural resource management are shaped, influenced and determined by deliberative interfaces among diverse knowledge systems associated with diverse groups of social agents engaged in the practice of natural resource governance. Analysis of this issue in the light of empirical evidence and theoretical perspectives can help us draw policy and practical implications for effective knowledge management and social learning in natural resource governance. The book is primarily an analysis of Nepal's experiences and the findings have much wider relevance. The rationale of the book rests on the need to explore innovative processes and policies to facilitate inclusive, deliberative and equitable governance of resources. Despite recent upsurge of participatory innovations in development actions (Chambers 1994; Chambers 1997) and natural resource management, there is a continuing concern over limited real achievement in terms of local livelihood, economic contributions and natural resource sustainability (Cook and Kothari 2001; Edmunds and Wollenberg 2002; Colfer and Capistrano 2005). Socially powerful actors tend to influence the resource governance decisions using various forms of power. They influence the values, behaviour and action of an individual as well as institutions in various ways. In this process, how the knowledge in practice is contested and politicised in influencing such decisions is a growing concern. Increasingly, it has become more important to understand the ways through which certain knowledge is legitimised within institutions and decision making process and how it is impinging on the daily lives and struggles of the poor and powerless, especially women and indigenous people who are highly dependent on forest resources for their livelihoods. In this context, there is a need to understand better the social dynamics of natural resource management with particular reference to knowledge related politics. Common pool resources, including forest resources, have been highly contested domains in developing countries including Nepal. Various actors with their diverse interests are engaged and influence the overall contexts, processes and outcomes of the resource management regimes. Over the past 25 years of implementation of community forestry in Nepal, about 35 per cent of the total population is involved in the management of about 27 per cent forest land, generating 900 million rupees annually from the sale of forest products (Kanel 2004). Underpinning this development is an increased level of citizen's concern over those resources.